The white dogs and I are on a journey of discovery and fun! Come learn more about double merles (lethal whites, double dapples) and how to live with and love blind and deaf dogs! When a dog loses its sense of sight, its whole world changes. There are many things that dogs can do without their sight, but dogs that started out sighted and are now blind are often confused and maybe even fearful when they can no longer see. They can't interact with their world the way they used to. Most likely, they knew landmarks around the house and yard by sight, they knew family members by their mannerisms and how they moved, they could see the steps were nearby, or that there was a curb or obstacle in front of them on their walk. Now, all that visual information has disappeared. It is a fairly common concern to pet parents that their dog appears depressed and may stop interacting with its world in the special ways it used to. There is, of course, going to be a time of transition when the dog will begin to relearn how to navigate by a different map. They will create a mental map, now relying more on smell and tactile information such as surfaces, air currents, and feeling their way around. There are ways that we can help our dog through this transition and encourage them to stay engaged with daily activities, to play, and to be active. The very first thing to consider, is that our dogs are very in tune with us and they take their cues from us. When we are worried about our dogs, and sad because they've lost their sight (which is normal for us to do), our dogs can sense these emotions in us. Our mood and our thoughts and feelings always affect our dogs. It is normal for us to grieve when our dog loses its sight. And it's healthy for us to grieve. There are many wonderful groups on social media particularly centered around dogs that are blind. These are great resources, and they are also great support systems. You can talk with people who will understand what you're going through, who can help you problem-solve, and who can tell you stories to give you hope. It's OK to comfort your dog if she's feeling confused or scared. You won't make her feelings worse. She needs to know you're there for her. Help her to feel safe and loved. But also help her to feel empowered and confident in herself. Teach her the skills she needs to know to become self-sufficient again. It may be overwhelming for your dog to try to navigate the entire house and yard suddenly without sight. It's often helpful to give your dog a smaller area to learn to navigate first. You can use gates or ex pens to create smaller areas for her to safely explore at first. And it is very helpful to have your dog wear a harness so you can easily help guide her along routes in the house and yard that she will use often. Go at her speed, and help her to avoid obstacles. It's no fun for anyone to run face-first into a doorway or a table. With consistent guidance, she will begin to learn how those routes smell, how they feel to her feet, and how many steps to take between point A and point B. Try to keep furniture and the layout of her world the same. Keep her food and water in the same place, her bed where it has always been, etc. As she learns these routes, you will find you need to guide her less and less until she can do it herself. This will give her confidence. Encourage play with favorite toys as she is ready. I use longer plush toys, so there is room for my hand at one end, and still plenty of room at the other end for the dog to grab the toy without grabbing my hand (because she can't see it). Will she chase it if you toss it across the room like you used to? Perhaps. But it is more likely that you will need to learn a new way of playing with her. Move the toy back and forth near her, but touch her with it playfully as you pull it around on her level. Let it move over her paws so she can feel it moving and be tempted to grab at it. If she can hear, use your voice to excite her in the same ways you used to so she recognizes this is a game. 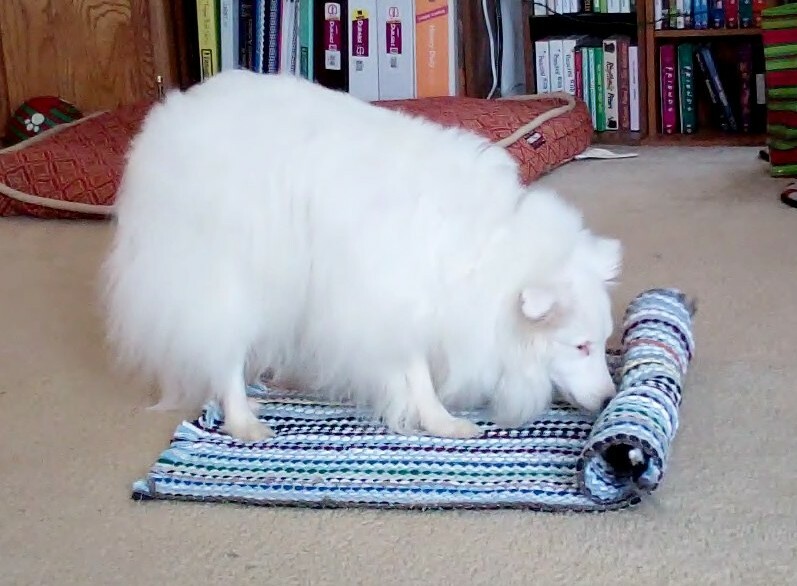 Many blind dogs enjoy light tug of war games with toys. This way, she can play while keeping the toy in her mouth where she can keep track of it. Some enjoy chasing toys that make noises as they move - giggle balls, balls with bells inside (always supervised! ), stuffed toys that continue to make noises after they are squeezed, etc. Most enjoy toys that can be stuffed with yummy treats to tempt their noses and taste buds. These can be played with as toys, used as enrichment activities, hidden around the room for her to sniff out and find, etc. Blind dogs still enjoy going for walks and outings. If she liked to ride in the car, continue to take her out and about. Don't stop doing her favorite things just because she can't see. She will enjoy the smells of going some place new, the breeze in her face, the lick of your ice cream. If your dog is reluctant to walk, take it slow. Just take her out and go at her pace. There's no place you need to go in a hurry, right? Just let her explore at her pace. Give her time to acclimate to the new surroundings. Maybe sit with her and read a book if you need something to occupy the time while you wait. She will eventually step out and begin sniffing around. This creates confidence, and if you do it often, she will begin to go farther and farther. Your dog may appreciate it if you wear a small bell or a set of keys on your belt loop when you are out for a walk so she can easily hear and keep track of you. Take time to reteach her how to walk with you on a leash. I prefer to use a harness with a leash attached to both the front ring and the back ring at the same time. One end of the leash to each attachment point. If your leash only has one clip, you can use a lightweight carabiner clip on the handle end of your leash to attach it to the harness. This allows your dog to receive more information about where you are, how fast you're going,etc. Your dog probably kept track of you on walks by sight in the past. Now she will need to relearn how to use her other senses to keep track of you - by smell, by hearing where you are, and by feeling you through the leash. Teach her verbal and/or touch cues to help her navigate her world. Teach her to stop and wait, to step up or down for a curb or a set of steps, etc. These will help her understand her world better, and will help you to keep her safe. Enrichment activities are important for any dog, but can really help to increase a blind dog's confidence and interest in the world around her. You can use your dog's regular meals to encourage toy play by putting her food in the many varieties of puzzle toys that are available. You can even make your own in some cases. Enrichment activities can use all the senses she has available. So taste of course, and smell is very important. Snuffle mats are great for encouraging sniffing and searching. You can teach her to search out treats or toys you hide (easy at first and then making the game more challenging) in the house or yard, or even out on your walks. If your dog can hear, try hanging a wind chime, or playing music. And touch is important too - helping her to feel confident on all surfaces will go a long way toward helping her be more active. A dog that is not confident walking across tile floors, for instance, is more likely to remain in her bed than venture out and risk walking on one. Even if she used to walk on your kitchen floor, she may be hesitant to now. Remember, this is new for her to experience the same floor but through different sensory input. Teach your dog new things! This will help get her up and active and engaged with you and her environment. There are so many ideas here in this blog! Have a look and pick something you'd like to teach your dog. Tellington TTouch, massage and other calming touch, and modalities such as Healing Touch for Animals, will help reduce your dog's anxiety and stress, and will help her to relax. A relaxed dog will be more likely to try new things and to play. Plus, these are techniques you can learn to do yourself with your dog, so they will also help to relax you at the same time! 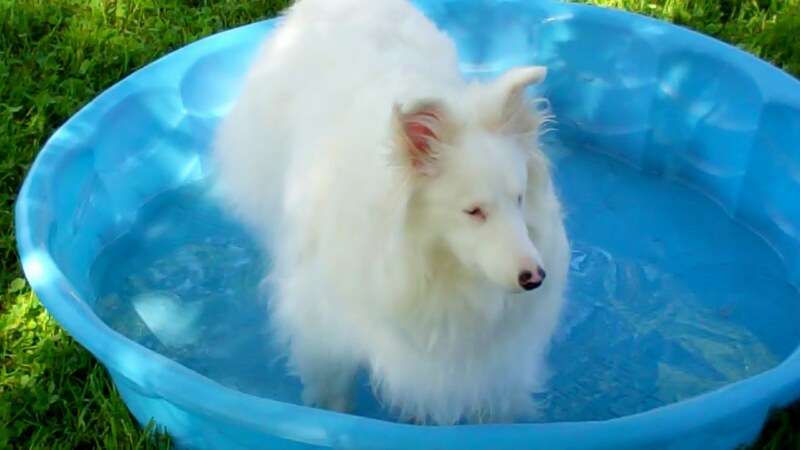 I've written many posts here in the blog about enrichment activities, food toys, and even teaching leash walking to a blind/deaf dog, that may be useful to you during this time of transition. The most important thing to remember is that this IS a time of transition. For you and your dog. Be patient and be kind in guiding her and helping her. Allow yourself to grieve, and then, allow yourself to empower your dog. Empower her to be confident and to try new things, and cheer her on every step of the way. Really, This is an Informative blog, I like it.